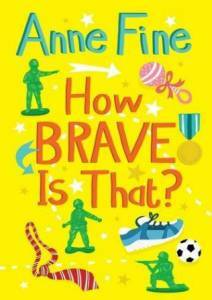 Anne Fine: How Brave is That? Tom wants to join the army, but he has to pass his exams first! When he turns up without proper uniform on exam day, strict Mrs Dell threatens to send him home. There are spare clothes available, but is Tom brave enough to face the exam hall - in a skirt? How Brave is That? is a book by Anne Fine for reluctant readers in the middle age group, illustrated by Vicki Gausden. It was published by Barrington Stoke, on 15th May 2013. Click the logo to order How Brave is That? from .